Bowls, plates, cups and trays, perfect for buffets and finger food, available in different sizes, diameters and shapes to serve any kind of food. For example, multi-compartment trays and dishes are a practical, elegant way to serve entrees or the sauces and condiments that go with each dish. All made of Mater-Bi® or cellulose pulp from sugarcane, bamboo or straw. 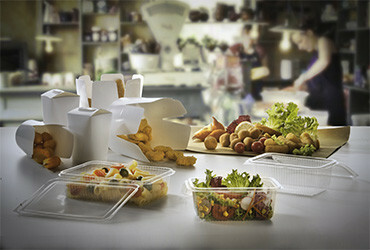 So they are entirely biodegradable and compostable according to the EN13432 standard. They may be used to serve cold or hot foods, up to 100°C, and may be used in a traditional or microwave oven. Some are also available in an unbleached natural colour that perfectly fits in with the concept of sustainability you want to communicate.